The village goes through a remarkable development the last few years. Besides the port, it has adequate tourist facilities and many entertainment choices. 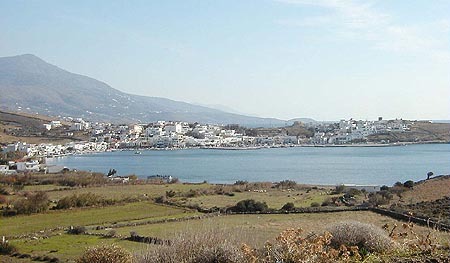 Together with nearby Batsi, it is the main destination of the visitors. Here is the starting point for excursions towards the northern part of the island, for startling beaches like Fellos and Zorkos and picturesque villages like Vitali, Amolochos, Makrotantalo, etc. Towards the south the consecutive golden beaches will impress you. In Agios Petros area don't miss seeing BAgios Petros Tower, an ancient rare building, still standing in good condition.